It’s time to try out that Porthole Eyelet. Here’s a hint, generally when I announce a new technique, I like to give you an example of how to use it. And so here we are, with a new design announcement following on the heels of the new eyelet . My hope is that pairing ideas with patterns, will not only let you see how I use it, but will inspire you to find ways to use them in your knitting as well. Shown here with Malabrigo Rios and my wonderful niece, Ellie. For this stitch pattern, I combined two Nuances to create a clean and modern take on this popular leaf pattern. It’s time for Fall knitting after all. The double Showy Decrease stands out on the knit fabric and the Porthole Eyelet is strong enough to hold it’s own in contrast. Duille, by the way, is Irish for leaf. Ponchos are a mainstay at this time of year, so a poncho design using lots of techniques was on my list. I don’t want to say this is the kitchen sink of poncho designs, but it kinda is. All my designs have interesting edges. I believe this detail is noticeable on the finished project and consider them integral to the overall design. 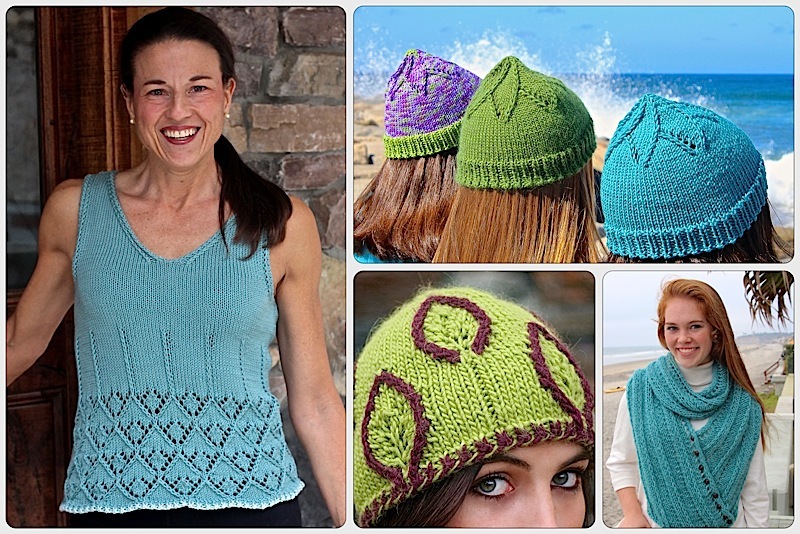 The decorative Resilient Cast On and Knotted K2Tog Bind Off are perfect for curved edges. They have more give than a standard bind off and the added time (just a bit) it takes to work them really pays off. We’ve already mentioned the combination of the Showy Decrease and Porthole Eyelet on the front. The wave created by this combination is pure fun. The linear stitch pattern also means it’s easy to keep track of. There’s a party in the back too with a deep broken rib whose vertical lines were inspired by the beautiful Aspen trees in my area. Yup, I went all in with that Fall theme. The Showy Decrease is used in two ways on the back. The first is to work perfectly symmetrical shaping. One of the best features of the Showy Decrease is that the k2tog and ssk decreases match perfectly. You can see the smooth k2tog line that shapes the poncho to the right. The high visibility of this technique make spotting and working the decrease in your knitting much easier. The raised edge of the Showy Decrease adds depth to any rib. As an added bonus, the elongated stitch provides high contrast to the seed stitch that’s part of this stitch pattern. Want to give it a try on its own? You can find it in our Ban Boring Hat Brims post and a 2-sided version in the Seismic Waves Scarf. This reversible scarf was announced early in the blog’s history so it got little attention, but it’s really eye-catching. The perfect gift knitting for anyone. Here’s a small flat swatch to show you how the leaf pattern works. As you can see, the unblocked swatch is really (really) wavy. You decide how much to block out. I steam blocked for better control. Grab some squishy Sport or DK yarn, expand this swatch and you’d have a lovely scarf or shawl. You will need to know how to read charts to knit this project. There are written instructions to get you started but the bulk is charted. Not a chart reader yet? Download our handy Chart Reading Tutorial. Need help with the Porthole Eyelet? There’s a video for that. Just click on over to the Knitting Nuance YouTube Channel for our new video on how to ‘knit 1, yarn over, knit 1 into the same stitch in the row below’ (kyok-rb). Ready to give the Duille Poncho a try? You can find the pattern here on Ravelry. When you knit the poncho you will see the benefits of each technique and how they all tie together in a design. You’ll start to use the Resilient Cast On and Knotted K2tog Bind Off in other projects you knit and maybe, you’ll start to rethink your knitting to find areas where you can add interest too. Exquisitely done. Love the varying textures of this poncho. Thanks! It was really fun to play with all the textures. M-R, You’re making me laugh again! I am heading to your neck of the woods for a few weeks starting Oct 21 – Sydney, Cairns, Aires Rock, Adelaide, Kangaroo Island, Tasmania. I hope you have a wonderful time, Laura ! Will it be simply a holiday, or will your amazing talents be exhibited ? This poncho is stunning! Thank you for designing all the details that went into it’s construction! Just wondering if there are pointers for making the neckline smaller before binding off? Yes, I just need to think about it a bit. To be honest, I am never quite sure what will happen at the end of a new design. I design as I go for the prototype then make adjustments on the next one. Here, the back was really dipping. It’s pretty, the back ribs form a nice curve that’s a little longer than the front but that meant I needed a lot of decreases on the front edge. A few decreases could easily be added to the side also. I’ll play with it on paper and let you know. This entry was posted on September 11, 2018 by Laura Cunitz in Edges, Nuances, Other Nuances, Patterns, Showy Decrease and tagged knit poncho, knitting, Porthole Eyelet.